1963 | The Fantastic Flame On! Wow, the last couple of days have seen Reed really pull ahead to solidify his position as the second-most common trope of the Fantastic Four. 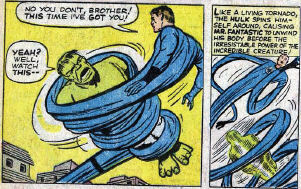 I’ve included both panels today as I love the idea that Reed is fast enough to launch his torso into the air and wrap it around the Hulk as he is in mid-leap, and the way that, still in the middle of the leap, the Hulk is able to generate enough centrifugal force with his own body to unravel Mr Fantastic. 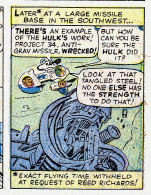 Thankfully, the Hulk would rarely be seen with such astonishing leaping powers again. Check out our coverage of Fantastic Four #12 in our tenth episode: Hulk? Smash! Here it is folks, the first punch thrown in one of comicdom’s most enduring rivalries. 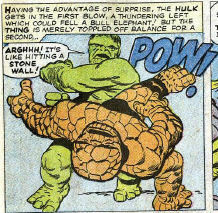 At this stage in the Marvel Universe, the Thing and the Hulk are clearly the two strongest and toughest people around. Namor comes close, but Fantastic Four #9 showed that without the intervention of the storm, Ben would have triumphed over the Sub-Mariner. So it’s surprising that the first meet-up between the two should be so brief. This panel is the entirety of their fight. After teasing us with the cover and with Ben’s imagining of the fight earlier in the book, this punch-up is a bit of a disappointment in its brevity and how quickly Ben goes down. Ah, now, this is more like it. I think we’re all used to Reed using his body to break somebody’s fault, but normally he’s stretched out between, say, a couple of lampposts to provide him something to brace against. Here, he does his best Great A’tuin impersonation (go check out the concept of the Discworld for an explanation behind that reference), using his own limbs for bracing. Ah, those halcyon days of times past. When an army base conducting top secret weapons research involving gamma rays would have a strange egg-shaped rail-mounted transport pod that anyone could jump into, only to find themselves at risk of being blown up by a booby trap laid by a most-literal card-carrying Communist spy with a penchant for kidnapping teenage sidekicks. Ah, those halcyon days of times past. When a Fantastic Four comic would trail the appearance of the Hulk on the cover of the comic, only to be repeatedly sidetracked, ensuring that by the 3/4 mark, we have yet to see the jade giant himself. It’s not often that Kirby and Lee let their pacing instincts draw them this far off course, but with Fantastic Four #12, the moody and ominous cover acts as a tease to a fight that barely gets to happen in the issue. Thankfully, the next time the Hulk would meet the Fantastic Four, the action quota would be more than met. Anyway, waxing lyrical has led me astray as well. Johnny’s catchhrase is here employed as he charges off to try and save Ben from the exploding egg-shaped transport pod. Come on Reed, get stretchin’! Johnny’s crazy power usage is getting out of control! And if we ever needed an explanation of why Johnny’s power usage could be classed as ‘unlikely’, then this is it. Banner’s assistant has dropped his wallet on the floor, and instead of walking over to it and picking it up, Johnny decides to try and use a ‘flaming lasso’ trick that he’s been thinking of. It really is rather lucky that instead of setting fire to the flammable wallet and incinerating everything within, Johnny manages to pick it up from afar and bring it over to him. The reason for this being lucky? Without the evidence contained within (a Communist party membership card, making the assistant a literal card-carrying Communist), the finger of suspicion would never have moved away from the Hulk. I’ve waxed lyrical both on the podcast and on this blog about how much I love the conceit that in the Marvel universe, Marvel comics exist purely as a licensing entity, creating comics based on the real-life exploits of super-heroes. This panel is a very subtle example of Stan using the subtleties of this gimmick in his storytelling. The original ‘bathtub’ Fantasticar has been replaced by the sleeker, more modular incarnation, and on his way down to New Mexico, Reed can’t help showing it off to General Ross. However, he’s not giving away the speed, oh no – he’s even dropped a line to Marvel Comics to ask them not to mention just how fast The Fantasticar goes, hence this rather esoteric and wonderful editor’s note. However, this conceit does rather sabotage the entire plot of the story. We’ve previously seen Johnny reading a copy of The Incredible Hulk #1, so why, as soon as he sees Bruce Banner, go ‘Hey, he’s the Hulk!’ and save everyone a lot of time?